Not The Barnet Times: Gordon is a moron! Brian Gordon, Tory councillor for Hale Ward, has exceeded DCMD’s low expectations of him with a typically ignorant letter to the Barnet Times criticising the student protests against the increase in tuition fees. Perhaps Cllr Gordon was hoping that his letter would detract attention from the hypocrisy of the Conservative Party which bitterly opposed tuition fees when introduced by former Prime Minister Tony B Liar, only to triple them once in office. Nobody disputes that the country is almost bankrupt thanks to Gordon Brown’s insane financial mismanagement of the economy but, as Whitney Houston put it so eloquently, children are our future. We should teach them well and let them lead the way out of recession. Education is a right, not a privilege, and to save money by putting up tuition fees or reducing the education budget is a false economy. Given that we don’t actually make anything in this country anymore, our future prosperity lies in a skills based economy. Perhaps this is a concept that Cllr Gordon, who receives £25,930 per annum in allowances from the taxpayer, is unable to grasp. One thing can be said with 100% certainty. Students did not cause this recession, yet they are being asked to suffer the consequences and pay for the profligacy of others. It is their futures we have mortgaged without seeking their consent. In a free and democratic society, we should welcome peaceful protest and it is to the students’ credit that they recognise the iniquity of the Government’s policy. There is not a shred of evidence that any of the recent troubles were caused by Barnet Sixth Formers. Brian Gordon complains about “a lack of natural respect for authority.” Given that the council, of which he is a member, lost £30 million of taxpayers’ money in dodgy Icelandic investments, overspent £11 million on the Aerodrome Road bridge project, and brought ridicule on the Borough with the recent Allowancegate scandal, it is not entirely clear on what basis Cllr Gordon thinks he is entitled to any respect from students, or anyone else. The picture was taken a few years ago. 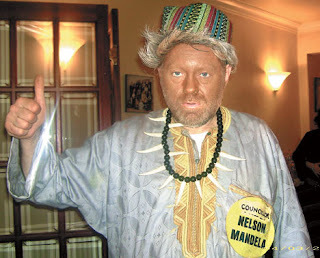 Brian Gordon had dressed up as Nelson Mandela for a Purim party. The politically correct and insufferably tedious LibDems thought that this was a highly offensive thing for a white man to do and called on him to resign. DCMD wrote to the local press asking if the LibDems would also call on the BBC to sack Harry Enfield who was, at the exact same time, performing a Mandela routine in his TV show. That was different, of course, because Harry Enfield is a lefty and Brian Gordon is a Tory. This was one of only two occasions when DCMD defended Brian Gordon in public, not that he ever thanked him for it. One of Brian Gordon's main arguments against the local student protest was that it took place "during curriculum hours" and that "it is surely wrong for them to take time off from their learning schedule in order to attend demonstrations". However the protest was held after school. If he had actually bothered to read the report in the Barnet Times it clearly stated "More than 150 sixth form and GCSE pupils took to the streets for a march from ArtsDepot to the Finchley and Golders Green MP's Ballards Lane base at about 5pm." Lucy is right, the demo was after school and it was also extremely well behaved. If only our boorish and disrespectful Tory councillors were so well behaved in the council chamber. As for the photo: I disagree with you DCMD: I think 'blacking up' is offensive whether by Brian Gordon (not noted for a 'sense of humour') or Harry Enfield. It is particularly unfunny to see a member of an ethnic group, which has suffered centuries of bigotry and stereotyping, clowning around in such a way; yuck. Just goes to remind us of the questionable judgement and highly unimpressive quality of Tory councillors in this shambling administration. Is this the same Councillor Gordon whom stated that, being a Councillor he should be exempt from paying fines for illegally parking his car? Wheres his Respect? I really do get fed up with this sort of nonsense. When Eddie Murphy ‘whited up’ in Coming to America, nobody complained. The film ‘White Chicks’ was played by two black actors. Black actors whiting up and nobody bats an eyelid, but a white person blacking up and everyone plays the race card. It is utterly ridiculous. Is society so insecure that people should only be allowed to impersonate others from their own racial group. Should only Jewish people be allowed to tell Jewish jokes, or Irish people tell Irish jokes? Racism is a particularly nasty trait and whilst there are many legitimate reasons for criticising Brian Gordon and Harry Enfield (not being funny being the main one) there is not the slightest evidence that either of them is racist. It’s an impersonation. You either like it or you don’t. Brian Gordon didn’t impersonate Nelson Mandela because he was black - he impersonated him because he was famous. I try and write a blog criticising Brian Gordon and now end up having to defend him again. Oh come off it DCMD: it's a question of historical context, the situations are not equal at all. The answer to your question on the second paragraph is clearly yes: if an Irish or Jewish person tells a joke about someone like them, it is ok, because it is between equals: it simply shows disrespect and rudeness, at the very least, to make fun of someone else's racial or ethnic background. We are too close to the harsh reality of what happens when Jews or the Irish were vilified by outsiders, and it is too sensitive an area. It's not a matter of boring pc, but of trying to show respect and build bridges between different people rather than always emphasising differences. Don't let me stop you criticising Brian Gordon, though: plenty of material there, one would have thought, not even counting his cringe making Nelson Mandela act. Memo to DCMD. Don't send Mrs Angry Omid Djalili's DVD for Christ...er Winterval. I ain't Jewish but a Heinz 57, half the ingredient being Oirish, programmed by Irish Christian Brothers and the Jesuits although, Mayor Tony 'Mickey' Finn will deny what part of him is which kind of Finn. Have to agree with you on everything you said in defence of Brian Gordon. I'm celebrating Chanukah in my ghetto and also Christmas, always remembering that Jesus was born Jewish. No offence intended to anybody of any culture class colour creed or political motivaion of any kind. I do find Barnet politics quite depressing these days but your description of Tony O'Finn had me in stitches! Thank you. £100 million. The real cost of BT Vital Vision? Can we have the one with the banana? F.A. no better than F.I.F.A.